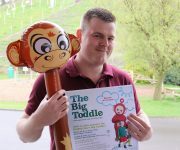 It will be a case of on your marks, get set, Po, when one of TV’s Teletubbies joins the Barnardo’s Big Toddle at Dudley Zoo. Po, the red Teletubby from the CBeebies hit show, will join in the fun on June 12 – the first day of Barnardo’s annual sponsored walk for under-5s. The event, … Continue reading Get set, Po! 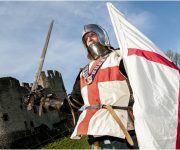 The borough’s St George’s Day celebrations promise something for everyone as the festival returns to Dudley Castle for another year. DZG is delighted to be the setting for the action-packed patriotic extravaganza for the third year running. The festivities take place on Sunday April 22 in the 11th century castle courtyard between 3pm and 7pm … Continue reading Celebrating St George!